Albert Paley, an active artist for over 40 years at his studio in Rochester, New York, is the first metal sculptor to receive the coveted Institute Honors awarded by the American Institute of Architects, the AIA’s highest award to a nonarchitect. “The allure of Paley’s art comes through its intrinsic sense of integration of art and architecture,” as one noted architect stated. Paley, Distinguished Professor, holds an Endowed Chair at the College of Imaging Arts and Sciences at Rochester Institute of Technology. Commissioned by both public institutions and private corporations, Paley has completed more than 50 site-specific works. Some notable examples are the Portal Gates for the Renwick Gallery of the Smithsonian Institution in Washington DC, Synergy, a ceremonial archway in Philadelphia, the Portal Gates for the New York State Senate Chambers in Albany, Sentinel, a monumental plaza sculpture for Rochester Institute of Technology, as well as a 65-foot sculpture for the entry court of Bausch and Lomb’s headquarters in Rochester, NY. Recently completed works include three sculptures for the National Harbor development near Washington DC, a 130’ long archway named Animals Always for the St.Louis Zoo, a gate for the Cleveland Botanical Gardens in Cleveland, OH, a sculptural relief for Wellington Place, Toronto, Canada, Threshold, a sculpture for the Corporate Headquarters of Klein Steel, Rochester, NY, and Transformation, a ceremonial entranceway for Iowa State University in Ames, Iowa. 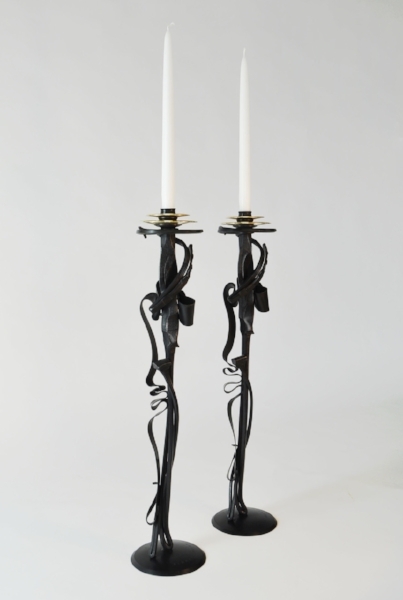 Pieces by Albert Paley can be found in the permanent collections of many major museums including the Metropolitan Museum of Art in New York, the Museum of Fine Arts in Boston, the Museum of Fine Arts in Houston, and the Victoria and Albert Museum in London. Broadly published and an international lecturer, Paley received both his BFA and MFA from the Tyler School of Art in Philadelphia. He received honorary doctorates from the University of Rochester in 1989, the State University of New York at Brockport in 1996, St. Lawrence University, in Canton, New York in 1997,and the University of Gothenburg, in Sweden in 2012. 2017 Breckenridge, Colorado, Exterior plaza sculpture, currently in design and production. 2016 Fire Station Wall Relief, Tamaracs, Florida, Exterior wall relief. Hilo University, Hilo Hawaii, freestanding exterior entryway sculpture, 40’ H.
2011 Michigan State University, East Lansing, Michigan, external relief sculpture, 47’ L.
weathering steel, stainless steel and bronze, 40’ H.
2008 Trenton Station, Trenton, New Jersey, Zenith, freestanding exterior sculpture. Village of Hope, Orange County, California, entrance portal. National Harbor, Alexandria, Virginia, exterior pylon sculptures. 2007 Iowa State University, Ames, Iowa, Transformation, entrance sculpture. Klein Steel Corporation, Rochester, New York, Threshold, exterior sculpture. 2006 National Cathedral, Washington, D.C., Good Shepard Chapel Entrance Gates. St. Louis Zoological Park, St. Louis, Missouri, Animals Always, exterior plaza sculpture. 2005 Memphis Museum of Art, Memphis Tennessee, Memphis Portals, exterior gates. Lake Mirror Park, Lakeland, Florida. Tribute to Volunteerism, exterior sculpture. Cleveland Botanical Garden, Cleveland, Ohio. ceremonial archway. Monahan Pacific, San Rafael, California. Volute, exterior sculpture. M D Anderson Ambulatory, Houston, Texas. Tree of Life, interior sculpture. 2003 Rochester Institute of Technology, Rochester, New York. Sentinel exterior sculpture. 2002 Hotel Pattee, Perry, Iowa. Reconfiguration, pair of sculptural archways for courtyard. Wellington Place, Toronto, Canada. Constellation, sculptural relief for façade. Columbia Public Library, Columbia, Missouri. Cypher, pair of entrance sculptures. 2001 Florida Gulf Coast University, Fort Myers, Florida. Cross Currents, exterior sculpture. 99 North La Cienega Blvd., Beverly Hills, California, Oblique, exterior sculpture. The Commission Project, Rochester, New York. J D Award Sculpture. 2000 Naples Museum of Art, Naples Florida. Portal Gates. University of the South, Sewanee, Tennessee. Architectural Screen. 1999 Florida State University, Tallahassee, Florida, Stadium Gates. space including sideboards, sconces, and mirrors. and lighting features for plaza complex. Anchorage, Alaska, The Municipality of Anchorage, Solstice, exterior sculpture. University of Toledo, Toledo, Ohio. Symbion, exterior sculpture. Ohio State University, Columbus, Ohio. Gnomon, exterior sculpture. American Bankers Insurance Group, Miami, Florida. Exterior Sculpture. Victoria and Albert Museum, London, England. Sculptures, honorary awards. Miami University, Oxford, Ohio. Entrance Portals for Alumni Hall. 1995 Federal Building, Asheville, North Carolina. Passage exterior sculpture. Victoria and Albert Museum, London, England. Museum Bench. 1991 State University, Phoenix Campus, Phoenix, Arizona. Ceremonial Gateway. 1990 AT&T, Promenade Two Building, Atlanta, Georgia. Olympia, exterior sculpture. Roanoke Airport, Roanoke, Virginia. Aurora, exterior sculpture. Birmingham Museum of Art, Birmingham, Alabama. Confluence, exterior sculpture. 1989 City of Rochester, New York. Main Street Redevelopment Project. Bridge Railings. Naples/Marco Philharmonic Building, Naples, Florida. Main Entrance Doors. 1988 Cornell University Medical College, New York, New York. Window Screen. 1987 Wortham Center for the Performing Arts, Houston, Texas. Eight Stairway Sculptures. Massachusetts Bay Transit Authority, Milk Street Station, Boston, Massachusetts. Museum Towers, Philadelphia, Pennsylvania. Synergy, exterior archway sculpture. New York State, New York State Governor's Art Awards. The Willard Building, Washington, DC. Interior sculpture, Door Handles. 1984 Light Rail Transit System of Pittsburgh, Pittsburgh, Pennsylvania. Poster Cases. Harro Theater East, Rochester, New York. Conclave, exterior sculpture. 1983 Hyatt Grand Cypress Hotel, Orlando, Florida. Stair Enclosure. Clyde's Restaurant, Tyson's Corner, Virginia. Fountain. Merritt Gallery, Rochester, New York. Entrance Gate. Marriott Hotel, Washington, DC. Gates. 1982 Strong Museum, Rochester, New York. Exterior sculpture. and Benches for Pennsylvania Avenue. 1980 New York State Senate Chambers, Albany, New York. Two pair Portal Gates. Prospect Place, Washington, DC. Exterior Clock. 1978 City of Philadelphia, Redevelopment Authority, Security Screens. 1975 Hunter Museum of Art, Chattanooga, Tennessee. Sculpture Court Enclosure. 2010 American Craft Council Gold Metal Award for consummate craftsmanship. 2014 Albert Paley Retrospective, The Corcoran Gallery, Washington D.C.
along the median of Park Ave, NYC. 2012 Albert Paley Sketches & Steel, The Polk Museum of Art, Lakeland, Florida. 2011 Albert Paley Sculpture, Naples Museum of Art, Naples, Florida. 1996 Art to Art: Paley, Dine, and Statom, Toledo Museum of Art, Toledo, Ohio. Tokyo Art Expo, exhibition of sculpture and project documentation. Tokyo, Japan. 1976 Invitational Exhibition, Zlatarna Celje, Celje, Yugoslavia. Design Award. Gilbert, Lela. Albert Paley Reconfiguration. Pintaubo Press, 2008. Shearer, Linda. Albert Paley Threshold. Milan: Skira, 2008. Kuspit, Donald. Albert Paley: Sculpture. Milan, Italy: Skira, 2006. York: RIT Cary Graphic Arts Press, 2005. Arts. Tallahassee, Florida: Florida State University, 2001. BYU Museum of Art. Albert Paley: Age of Steel. Utah: Brigham Young University, 1996. New York: University of Rochester, 1994.
international Internet distribution May – June 2013. State Emmy Award. (Approx. 60 min. High Definition video) PBS National Broadcast. 1994 Albert Paley - Metal Artist. NHK TV (Japanese Public Television). In Japanese (Approx.